At snapdeal.com you can purchase HealthSense Ultra-Lite (PS 126) Digital Personal Weighing Scale for only Rs. 1,279, which is 4% less than the cost in Flipkart (Rs. 1,329). 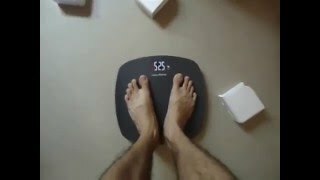 The lowest price of Health Sense Ultra-Lite Personal Weighing Scale(Grey) was obtained on April 17, 2019 10:28 pm. This is fairly accurate and helping me to achieve my weight goals. Great built and awesome cherry colour. Nice weighing scale. Very light weight and accurate. Im using it with my patient’s. Great product. I like it. But will see how durable and long lasting it is. Looks perfect.. doesn’t look cheap… 99% accuracy. Only thing bothering me is the life of this machine. It’s very light and feels plasticy. I have ordered it at 999.On the very first day I checked that the variation is coming within a range of 1 kg which is not in accordance with what they claim.Otherwise a decent product to purchase if at a discount.